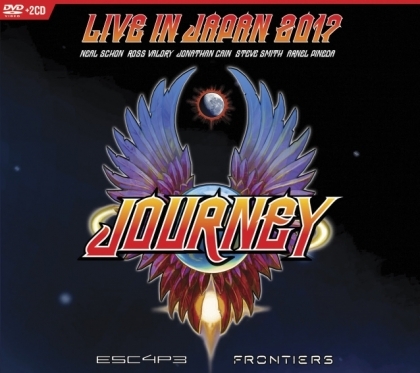 In 2017 Journey played the Budokan arena in Japan for a special show where they played two of their classic albums – 1981′s ‘Escape’ and 1983′s ‘Frontiers’ – in their entirety and recorded the show, which have now been released by Eagle Vision/Universal [Release date 29.03.19] as a double CD and DVD package. Those albums ‘Escape’ and ‘Frontiers’ have produced eight Top 40 singles combined and sold nearly 20 million copies worldwide. This performance includes all of the original recording line-up (guitarist Neal Schon, drummer Steve Smith, bassist Ross Valroy and Jonathan Cain on keyboards) except vocalist Steve Perry. Current vocalist Arnel Pineda is more than capable of doing these Journey classics justice, what an amazing find he was, keeping Journey and this legacy alive. The setlist won’t hold any surprises, although with the ‘Escape’ album being performed first you have arguably the band’s biggest song ‘Don’t Stop Believin’ being played as the opener, how many times has that happened I wonder? Live session musician Travis Thibodaux guested on keyboards and backing vocals, which allowed Jonathan Cain to play rhythm guitar and add some extra riffage to the band’s rockier numbers like ‘Stone In Love’ and ‘Lay it down”. Neil Schon is on fire during his short lived guitar solo, before the haunting “Mother, Father” takes centre stage. The first half of this concert closes with a Jonathan Cain Piano Solo which leads fluidly into” Open Arms”. The concert has a minimal stage set, no big extravagant light shows nor monster monitor stacks, with just a simple backdrop which I feel is a let-down, these two albums are huge and I would have liked more, make it a sense of occasion, though Journey may have just decided to “let the music do the talking”. Part two opens with a monster, namely “Separate Ways”. The hits just keep on coming with “Send Her My Love” and ”Faithfully”. However after the highs of “Faithfully” and the gigantic “Edge Of The Blade” come the lows, namely a barely passable drum solo, and then “Backtalk” not one of the best songs on the ‘Frontiers’ album and no real surprise the band haven’t played it live much. But it deserves one last final outing. The concert closes on a high, the massive crowd pleaser sing a long hit “Lovin', Touchin', Squeezin”. A fantastic step back in time dvd, of a fantastic legacy.